The finest band of Rebel scum since Luke and Pals get their due in this fall’s Disney Infinity 3.0. 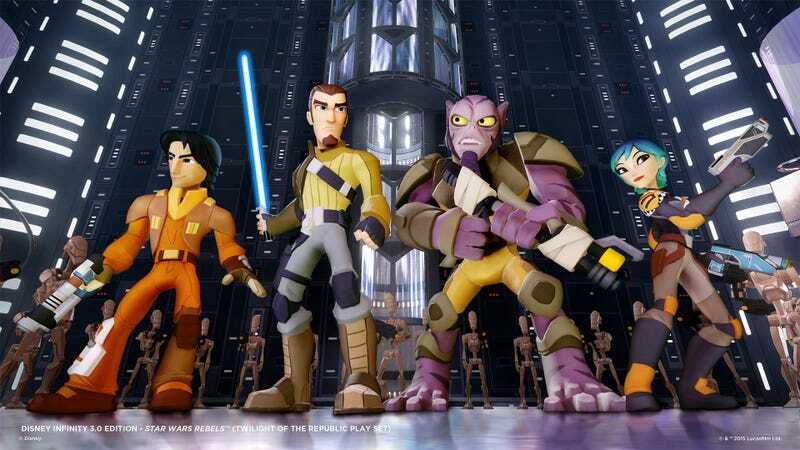 That’s right, my favorite Star Wars is currently an animated series. While I’ll always have a soft spot for the originals and a hard, prickly spot for several characters from the prequel, the crew of the Ghost and stars of Disney XD’s animated series (season two of which launches June 20!) are my current Star Wars loves. So when the Star Wars-themed sets start popping for Disney Infinity 3.0, my team is going to be young Jedi Ezra Bridger, hipster Jedi Kanan Jarrus, Lasat warrior Garazeb Orrelios and Mandalorian grafitti artist Sabine Wren. Star Wars: Rebels season one was a complete joy, filled with wit and charm and the perfect dose of emotional resonance. What’s most impressive to me is how it’s succeeded in telling Star Wars stories without relying (well, over-relying) on pre-established characters. Sure Lando and the droids show up, and the next season they’ve got Darth Vader to contend with, but for the most part its been this quirky crew doing right and learning important lessons about loyalty and friendship. Also The Force. Sabine and friends (yes I know Sabine is not the leader, she’s just the best) will be playable across all three Star Wars playsets for Disney Infinity 3.0, leading to some interesting crossovers we’ll hopefully never have to see in the show. If anything, this development will deliver a set of four figures much more show-worthy than the mildly-disappointing standard figures Hasbro’s put out so far.